For the past 10 years I've been reporting Scottish devolution from Holyrood. But, for the month of April, I made a journey across mainland Scotland to find out what difference devolution has made to people's lives. I cycled from Gretna Green to John O'Groats to meet people, record their thoughts and hear their experiences and, as I wound my way along hundreds of miles of highways and by-ways, I have been posting a diary of my journey here. A series of three programmes based on my travels will also be broadcast on BBC Radio Scotland at the end of May. I'm setting out on this 1,200 mile journey as a sort of penance. For the last 10 years, I've been reporting on Devolution from above. I failed to take a look at what's happening underneath. Being a BBC reporter at Holyrood is all about policy announcements, bills and speeches, occasional rows and colourful protests. Now, I'm about to find out what difference all this talking and those 140 pieces of legislation have made. We now have free personal care, a smoking ban, two national parks, a more regulated nursing home system, a ban on fox hunting, no bridge tolls and a start on new railway lines. But perhaps we also have less tangible benefits . . . better public services, a feeling of involvement, a greater national pride, more self confidence. The pursuit of happiness may have become a little more possible. This is the hypothesis my cycle run is setting out to test. Who will I meet on this journey? What will I see and hear? I don't know. It's an unscheduled inspection of a country I think I know well, but which I'm sure has many surprises lying in wait behind every tree and every street corner. I may be pelted with tomatoes if people find out I'm from "that Holyrood building up in Edinburgh". Dogs may bark if they catch a whiff of sleaze. Accountants may laugh behind their hands at the cost of all this home rule - £416m for the parliament building alone. And questions about devolution may seem irrelevant in a landscape desolated by the worse recession for decades. On the other hand, I might be cheered like a participant in the Tour de France bringing bright news from the capital of a new dispensation, a more benign, listening and competent government. And the route? I start at Gretna Green on Saturday 4th April. Go on to Dumfries and then turn east across the Borders to Berwick. Then it's along the coast to Dunbar and through East Lothian to Edinburgh. That's week one. 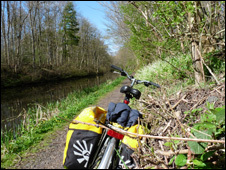 Week two will take me across the canal path to Glasgow and along to Dumbarton. North then to Loch Lomond and swinging east to Stirling, Perth and Dundee. By the end of week two I hope to be in Fraserburgh. Week three will take me to Inverness and across to Skye. And, in the last week, I'll be struggling into the Atlantic winds heading for Cape Wrath and Durness and, finally, along the top to John O'Groats. "I hope you've got your passport," said the man at the bridge over the River Sark at Gretna. It's an old joke but, in a way, I am entering a strange country. Take this "marriage mecca" for a start. 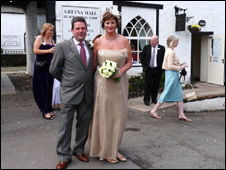 There are around 5,000 weddings here in Gretna Green every year. And it's big business, seven different venues, 10 registrars, a dozen retired ministers, three full-time pipers and I don't know how many Rolls Royce drivers and horse and trap owners. "Marriage was out of fashion for a while but it's coming back into favour as the times become less secure," said Jane Chandler, the senior registrar. She reminded me that there have been two important changes to the wedding laws since the Scottish Parliament came into being. Registrars are allowed to marry couples in any suitable place, not just the registrar's office, and civil partnerships have been brought in to keep up with the changing times. Fred and Catherine Fisher, from Liverpool, said they'd come here to be married because they liked Scotland for walking holidays. "It's been wonderful," said Catherine, in a wonderful Liverpool accent. So in a romantic mood, I cycled off west, into a head wind, of course. The Solway glistened in the sun. Lambs were leaping. Hedges twittered with birdsong. Daffodils and gorse lit up the countryside. And there was a discarded plastic bottle every hundred yards or so along the roadside. Griffel seemed to say, like all mountains, that he was here before all this human nonsense began and he would be here when even talk of Devolution had died away. In Dumfries I found myself being shown into Robert Burns' room at The Globe. Jack Harvie, who looked a lot like Souter Jonnie I thought, pointed to the four poster bed and said: "We're waiting for Rabbie to come back for the Homecoming." Next morning, after a good night's sleep in Rabbie bed - only joking - I cycled up the road to Keir Mill. It was here, at this whitewashed blacksmith's forge, that Kirkpatrick Macmillan invented the pedal bicycle in 1839. For me, this was the invention of the modern world, it set working men like me free. Quite rightly, it is going to be marked by a Bicycle Homecoming Festival next month. But at the time, Macmillan was considered a fool and an eccentric. Stones were thrown at him as he cycled past. Once, on a trip to Glasgow, he was fined five shillings for speeding, at 8 mph. What would old Kirkpatrick Macmillan have made of my next stop, the Seven Stanes mountain biking centre in the Forest of Ae. 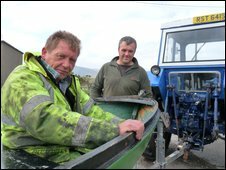 "We took the cattle waggon to the top," said Chris from Kirkby Lonsdale, as he scraped the mud off his bike. "Then we came down through the forest, cross country and downhill, as fast as we could. It was excellent." But for all his skill and expertise on his bicycle, he knew nothing about Devolution. He hasn't really lived. In Lockerbie, we don't mention Pan Am flight 103 any more. It's been over 20 years since the tragedy. I did however cycle along Sherwood Crescent, feeling dreadful, and was glad to find no trace of the destruction. Neat new little houses stood quietly on the site, though a woman told me there was a plaque in the garden at the corner if you looked carefully. I didn't, perhaps I couldn't. Next I entered the enchanted valley of Eskdalemuir and found a Buddhist temple shining in the sun. The Lama wasn't in, but I spoke to one of the nuns, Ani Lhamo, a very charming young lady from Fort William. She wore the dark red habit of her calling and had her head shaved. She'd been a nun here in Samye Ling for 20 years. "We get 30,000 to 40,000 visitors every year," she said, "but I don't know if Scotland has suddenly become a more spiritual country. I once gave the Time for Reflection in the Scottish Parliament but I don't feel qualified to comment on its work." I had my spicy lentil soup in the monastery tearoom and got back on my bike. How strange and moving it is, that all these statues of Buddhas and temples and peace pagodas and gardens - and they were busy building a new college quad - should exist up in the clouds here in the Scottish Borders. Finally, at the end of day three, I came downhill, with a bump, to Hawick. The dark satanic mills along the Teviot are fast dying. The welcome sign to the town says it's the home of cashmere. But in the Hawick News I read of Barrie Knitwear losing 19 jobs, Hawick Knitwear losing 32, Johnstons' losing 40. Unemployment, the paper said, has rocketed by 130% in the past year, 19% in the past month. In The Waverley Bar I met two young men playing pool. Paul and Karl had just lost their jobs, Paul with a wife and two children to support. "Yes, we're angry. And we're depressed. This used to be a great wee town. Gordon Brown is handing out billions to the bankers but he hasn't given Hawick 2 pence." I asked what the Scottish Parliament could do for them. "It's been good for Alex Salmond and the other MSPs but it's not done much for Hawick," they said. And their solution? They laughed. When I suggested the government should build a few more houses. They said. "Yes, anything to give us work." And so I move on ... to Jedburgh, Kelso, Berwick on Tweed and then north, chasing the sun. A wild west wind drove me along the hedgerows to Jeburgh and Kelso. 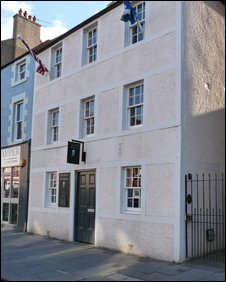 Just off the central square in Kelso is Britain's oldest fishing tackle shop, Forrest of Kelso, established in 1837. The man behind the counter, Trevor Black, was on the phone to a client in Russia when I entered the shop. But once that exotic call was over he told me the fishing has not been good on the Tweed this year. The usual catch of around 200 to 300 a week for salmon is down to 20 and no one knows why. "The Scottish Parliament has done quite a bit for fishing on the rivers like the Tweed," he said. "But generally, I think the Borders have been neglected. All the MSP's attention seems to be on the centre and north of the country." I'd been cycling past neatly-ploughed fields and new wheat or barley crops for mile after mile but, as a townie, I couldn't tell what was really going on. That's the shame of my generation, we've lost touch with the earth. So I looked up an old contact from the parliament's fox-hunting days. Alan Murray, one of the leaders of the Countryside Alliance, met me in the village of Sprouston, overlooking his farm and, calmly and patiently, he set me right. "It was a hugely disappointing start to the new parliament," he told me. "The fox hunting legislation was a basic misunderstanding between town and country. Fortunately, the bill was amended as it went through parliament and that has allowed fox hunting to continue under the new rules." He told me his potato crop has just been sown. The wheat he planted last October is starting to come through nicely. Farmers, he said, are proud of the food they produce. "I think the SNP government is at least listening to farmers - though it's limited in what it can do. So much is controlled by the market and by the European Union." The farmers' latest entanglement, of course, is over sheep tagging. Counting sheep, they reckon, has sent the Brussels bureaucrats into a deep and satisfying sleep and they only have till 1 January to snap out of it or else Scottish sheep farmers are going to be faced with costs that will cripple most of them. Being so near to the border at this point, I decided I should see what the view of devolution looks like from the other side. So I dropped down to Berwick on Tweed, a town which has changed hands a dozen times over the years but, for the moment, sits in England...except, of course, if you live in the parallel world of football. In "The Barrels Ale House" the customers were in no doubt. " Scotland gets all the advantages.....free personal care, free bus travel, free university education.....and the rest of us in the UK pay the bills." That was the general feeling. But would Berwick like to change sides or have a bit of devolution for itself.......oh no! Next day I battled against a head wind and staggered into Eyemouth. I parked my bike outside the ship chandlers' shop and soon found a friendly skipper to tell me the story of the decline and fall of the fishing industry. Ten years ago, the story went, this harbour was full, you could walk across from quay to quay on the decks of the fishing boats. Now there are only a dozen local boats left. "What's happening is, because of the European fishing restrictions, the big boats can only fish for half the month, " explained Eric Coates, known locally as "Zog", the son and grandson and great grandson of fishermen. "So they are now turning to prawn fishing and small boats like mine, under 10m, are having to divide the catches with them. And the Scottish parliament has done nothing to help us." Depressed and heading still further into the head wind, I searched for better news in Dunbar. John Muir's birthplace was my source of inspiration. 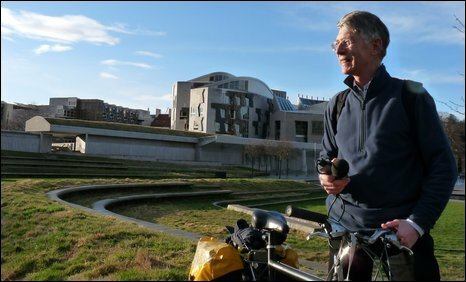 "I can't give the Scottish Parliament all the credit, but in the last ten years, the name and inspiration of John Muir has finally been recognised in Scotland," said Will Collin, retired head teacher and a trustee of the birthplace. There's now plenty of evidence in Scotland that this is indeed the birthplace of the man who invented the modern environmental movement. There's a country park named after him here along the East Lothian coast. Finally Scotland has its own national parks...almost the last country in the world to tumble upon the great Muir idea. And the environment is one of the recurring themes of the day at Holyrood... access rights, renewable energy, climate change. "I give the Scottish Parliament seven out of 10 on the environment," said the head teacher. " I like to be encouraging. But it could do better!" And so I end my travels in the south. Next week I set out from Edinburgh to explore the cities and the heartlands of Scotland, chasing the clouds of devolution. My journey through the heartland of devolution had to begin where it all began, in the Royal Mile in Edinburgh. 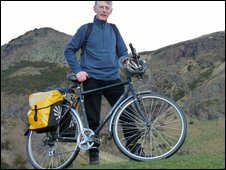 I pushed my bike on foot up the hill outside the Scottish Parliament because it's too steep for gentlemen cyclists like me to cycle. I passed the tourist shops and the jazzy piper and came to the Lawnmarket and the church Assembly Hall where the parliament used to meet when I first began reporting it 10 years ago. I actually preferred this location, because it had a street running through it. It kept the politicians - and the journalists - in touch with the outside world. From the Royal Mile I crossed the tram lines on Princes Street ... or at least the much-cursed road works - and headed for the Golden Mile, now the busy George Street. Outside the grand old headquarters of the Royal Bank of Scotland, I interrupted a couple having coffee in the St Andrew Square gardens. 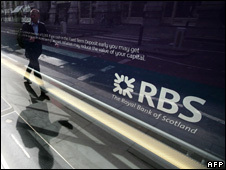 "I never thought the Royal Bank and the Bank of Scotland would collapse as they have," said Ian from Chirnside. "It was a real shock. And I thought the Scottish Government could have done more to save them." What, he wasn't quite sure. On my way into Edinburgh I'd been stopped on my bicycle by a man in his car, Mark, who'd heard about my trip through devolved Scotland and wanted to make the point that the bank he worked for, the Royal, wasn't broken. "We're still lending, and the ordinary staff are determined to put the past behind us," he said. "The senior managers let us down, but business will return to normal." He made the very valid point that, although the banking crisis may have caused a recession, and there's 5% unemployment, 95% of people are still in work and spending and things will recover. Somewhat cheered, I set out the next day along the Union Canal. The name must have had the same political overtones in 1822 when it was opened as it does today. It was called the mathematical canal because it followed the 240ft contour all the way to Falkirk, a distance of 33 miles, without a single lock. It involves several spectacular viaducts and a tunnel 600 yards long. The canals form an easy link between pieces of the "Scottish jigsaw"
"And we have difficulty putting in a few tram lines," said a woman walking in wonder across the Avon Viaduct. At Linlithgow I came across the Edinburgh Model Boat Club having a day out on the canal. One man, Mike from Dunfermline, had spent the last two years building a superb model of Captain Scott's ship the Discovery. The Falkirk Wheel is testament to the success of the Millennium project to reopen the canal from the Clyde to the Forth. The visitor centre was crowded. The towpaths, on this sunny Saturday, were busy with cyclists, walkers, joggers, families with children and dogs, fathers teaching sons to fish and calm, brilliantly white swans. I stopped overnight in Kirkintilloch. Here was a chance to see how a town of 45,000 people in the middle of Scotland was taking the recession. Badly it seems. "It's had a big impact on the high street," said one young chap in the Kirky Puffer pub. The Woolworths there had closed and several other shops had shut down. He and his friends work in Glasgow. But life goes on even here. And in the Smiths Hotel that night, the pink balloons were out for a charity dinner for cancer research. There were other encourging signs of a belief in the future. There's a new college on the outskirts of town and a new marina. 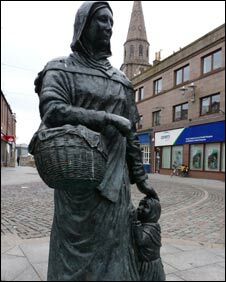 Kirkintilloch was, after all, the place where many of the Clyde puffers were built. The view over Glasgow from the canal, at Spiers Warf, is spectacular. The whole city lay beneath me on a misty Easter morning. The Cathedral was full, its pews spread with white cloth for the Easter communion service. Elders in morning dress showed us to our seats. The minister, Rev Dr Laurence Whitney, included the line in her sermon: "Easter is not an event, it's an experience." Much the same can be said of devolution. And outside, talking to one couple after the service, they certainly felt a little disillusioned with the experience so far. "The MSPs may have a moral agenda for the nation, but they have no personal moral agenda," they said. "They all have their noses in the trough." Down in George Square, sitting in the sunshine, folk were equally disillusioned. "I think Glasgow gets forgotten," said one man. A couple of young off-duty prison officers said prisoners were being given too easy a time by the government. The drug problem in prison wasn't being tackled and people out on community sentences were not being supervised. A little disillusioned myself, I set out again on the canal for Bowling, where it joins the Clyde. From there an excellent cycle track, built with Scottish Government money, the sign proudly proclaims, to encourage healthy living. That evening, I was on Loch Lomondside, looking north to the Ben itself, all lit up in golden sunshine. The national park here is one of the totem achievements of devolution. I wondered how it was working out. John Sweeny, of Sweeny's Cruises, standing on the deck of the very ship where Donald Dewar announced the plans for a national park, said: "It's been a success. But planning permission does take longer and is more controversial, and there's some disappointment that the elected members of the park authority always seem to follow the establishment line." By the end of the next day I was in Stirling. One of the curious things about this journey is how close all the pieces of the Scottish jigsaw really are. Yet we are in a different world here in Stirling. I followed the crowd of women - mainly women - heading to the Carlton bingo hall. Inside was an amazing, plush, cafeteria-like palace, with 400 people, heads down at their tables, listening to the numbers being called out in a quiet, calm sing-song voice. Every so often, someone would put their hand up and win a hundred pounds. "If I win, I can afford to come again," said Anne from Fallin, as she talked me through the process. Meeting friends was obviously a big part of her night out, and all for £10 to buy six bingo cards. 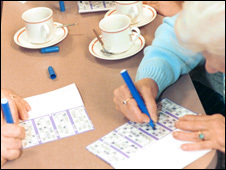 "Our biggest problem is the tax on bingo halls - imposed by the Westminster government. It's a tax on the poor," said the manager Findlay Meechan. "But the smoking ban has been resented here too. Why do all these elderly women have to stand out in the cold to have a smoke, couldn't there be a separate smoking room for them?" And a phrase I've not heard for a long time came tumbling out at the bingo hall, "They've forgotten the working class" said one woman, speaking of both the Labour Party and the SNP. And the SNP might want to ponder one more phrase, from Mr Meechan, speaking personally as a life-long Nationalist. "The banking crisis and the recession has made me think again about independence." So it's back to chasing the sun northwards, over the hills to Perth and Dundee and beyond. In Perth, I came across a remarkable man. Sandy Smith had just returned from his day job in Glasgow as a business manager and rushed straight to the South Inch playing fields to watch his football team, the Letham Lads, play against a team from Coupar Angus. The match ended in a one-all draw as the light faded at 8 o'clock. "I've coached this team since they were 13-year-olds, and now they're 17 and competing in the adult amateur league," Sandy told me proudly. "We train on a Tuesday and Thursday and play on a Saturday. It's a big commitment but I love it." In fact Letham Football Club has a total of 19 teams, for boys and girls. But they have to make do with just two full pitches and two small practice pitches. "There's a huge shortage of sports facilities in Scotland, even compared to when I was a boy," said Sandy. "And I don't think the Scottish Parliament, despite its message about healthy living, has done much to change things." 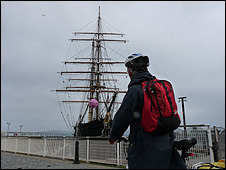 Next morning, I crossed the Tay and cycled through rich farming country towards Dundee. Just outside the tiny village of Knapp I saw my first red squirrel. Then I passed row on row of white plastic tunnels, each filled with row on row of raspberry plants. The migrant workers from Poland had not yet arrived but the caravans stood ready to receive them, like well-worn nests left from last season. My first discovery in Dundee was the technology park on the way into the city. "Over the past 10 years, Dundee has reinvented itself as a science city," said Jill Farrell, the regional director of Scottish Enterprise. "It's based around the bio-science department at Dundee University and the computer games expertise at Abertay University. We're now trying to build on that." Meanwhile I was reading in the Dundee Evening Telegraph that shops were closing left, right and centre. Even the famous Blues Bonanza music festival in June was in trouble because of the recession. So Dundee better reinvent itself pretty quickly. On board The Discovery itself, the crew were hauling up the main mast a large pink ball with the number 24 on it. The ship has just gone through a 24-month long refit with the help of £700,000 of lottery money. They rang the ship's bell, especially for me. There was a stiff, cold headwind as I struggled along the coast through Carnoustie, Arbroath and Montrose. Outside Stonehaven, I noticed a travellers' camp set up in a lay-by and knocked on the door of the first caravan. "We're due to be moved on today," said a rather harassed looking Edith McDonald. "Excuse the mess," she said as she invited me in out of the wind. With some of her three children and eight grandchildren around her, she explained that the whole family were hoping to be given a council house in Montrose but they were still waiting. "No, I don't think the Scottish Parliament has done much for the travelling people. We're discriminated against everywhere we turn." And this, despite several committee inquiries and petitions over the last 10 years and moves to have travelling people designated a distinct ethnic group. Stonehaven prides itself on being the home of the pneumatic tyre. It was invented in 1845 by a son of the town, Robert William Thomson. So with Kirkpatrick Macmillan's bicycle and Thomson's tyre, I'm more or less cycling a Scottish home-produced product. Perhaps Aberdeen invented the comfortable saddle! I needed it by the time I had struggled over the Slug road to Deeside and then made my way along the south bank of the river into the granite city itself. I was brought up here, and my first job was as a tea boy in a fish haulage firm by the dockside, over 40 years ago now. The big fishing trawlers have gone - there used to be more than 100 - and the brightly coloured oil supply vessels have taken their place. "Yes, the fishing vessels have gone and the oil ships are here but Aberdeen, being an enterprising kind of place will, I'm sure, move on to the next offshore industry when it comes - wind and wave energy," said John Edwards, the keeper of the maritime museum. I left the obvious wealth of the city centre - shops, restaurants, fast cars - and cycled out to Old Aberdeen to recall my pre-oil student days. As I stood listening to the ancient bell of St Machar's Cathedral, I heard a helicopter pass overhead. The sounds of the different centuries merged together uneasily. What strikes me most about the north east as I cycle along is the contrast between the prosperous-looking farms inland and the ragged coastline. From Aberdeen, I soon came across Donald Trump's sand dunes and wondered why anyone would want to put a golf resort in such a wasteland. 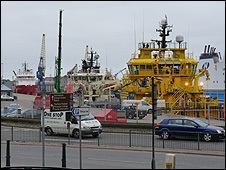 In Peterhead, the harbour was deadly quite, being a Saturday afternoon, and filled with oil supply vessels, not fishing boats. A group of fish processors stood outside their factory taking a cigarette break. "The business is doing well," they maintained." No lay-offs here." And the three big fish processors, I was told, are all finding fish to fry, so to speak. In the central square though I spoke to taxi driver Jim Elrick who told a slightly different story. "The fishing fleet here is down 25% in the last few years," he said. "The Scottish Government is doing its best to save it but it doesn't have the powers it needs." He's a fan of Alex Salmond. And this of course is Salmond country. "I used to run him around in my taxi before he became first minister." In Fraserburgh, I joined Harold Oldman on his night shift in the harbour control room. He explained that the fleet was out on the high seas taking advantage of the good weather. The huge fishing boats parked up in the north harbour were the "pelagic fleet" ie herring and mackrel boats which, these days, are only allowed to fish for a few weeks every year. Next morning, I met a skipper in from the white fish fleet to take advantage of the Sunday-for-Monday market. Alex Sanders and his crew had been out at sea for a week and were landing 280 boxes of prawns and 100 boxes of fish. "A good enough catch but the fishing restrictions are just too much," he said. "160 days a year at sea, it's ridiculous. Could you live on 160 days' wages a year?" He agreed the European Union was to blame but added: "The Scottish Government says it's doing all it can, but you wonder..."
Wandering round the harbour though I picked up a number of rumours and thoughts. One man told me there's no such thing as a poor skipper. Another told me fishermen are making too much money and are spending it on drugs. Still another told me Philippino crewmen earning less than £200 a week were replacing local seamen. I can't vouch for the truth of any of this, I just report what I was told. After Fraserburgh, the fishing villages become visitor attractions and little else. 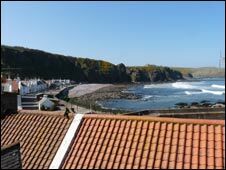 The inn at Pennan, the "Local Hero" village, has lain empty for over a year, a forlorn "For Sale " sign in the upstairs window. The cycle along this coast line, on a fine sunny day, was sheer glistening magic. A deep blue sea, a light blue sky, white waves, green topped cliffs and yellow gorse, Scotland was at its brilliant best. And there was no head wind! Macduff, Banff, Portsoy, Cullen, all are delightful bank holiday sort of towns. I was lucky in Buckie. I struck a lovely B&B with a view over the harbour, a working harbour for once. Its main business seemed to be maintaining the RNLI lifeboat fleet. The next day I headed inland to look at some of those prosperous, stone built, elegant farming towns of Fochabers, Elgin and Forres. As I cycled past fields of sheep and cattle and young wheat and barley, I could see where the wealth had come from in the past, and may do so again some day. "Prices are picking up," said Danny Leslie, who farms 300 acres outside Elgin. He didn't vote for the Scottish Parliament but says:" I suppose we have to live with it now. 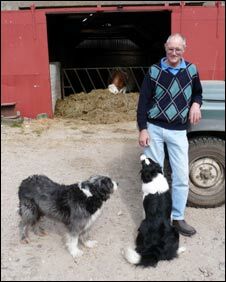 The present agriculture secretary Richard Lochhead seems, at least, to be trying his best for the farming community." I stayed overnight in the holiday town of Nairn and then crossed Culloden Moor into Inverness. The moor looked as bleak as it did on the morning of 16th April 1746, the last time anyone tried their hand at devolution plus. I endured my first real rain of the trip. And it continued to fall as I flew down the hill into the capital of the Highlands. Chatting to people outside Morrison's I found them surprisingly positive about the devolution project, more positive than elsewhere. And there was praise beyond measure for the NHS, particuarly Raigmore Hospital. The Inverness Courier had good news for Clachnacuddin Football Club - a housing development may well result in new dressing rooms for the club. But there was bad news for seagulls - Highland Council is to take "direct action" against them. No, not councillors out shooting them but officials removing their nests and, a petition to parliament for a change in the wildlife laws that protect seagulls from persecution. I have now seen my fifth dead badger by the roadside. And so I continue my dangerous journey into devolution north of the Great Glen. 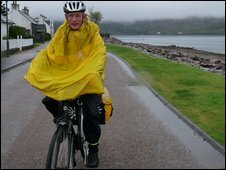 I had one of those glorious summer days you get in the early spring to cycle from Inverness to Skye. Even with a slight head wind it's only a day's journey from one side of the country to the other and the world completely changes. There, suddenly, in front of me was western sea and the Skye Bridge. The big, white bridge has become a battle cry against the use of private finance for public projects. The Scottish Parliament gained a lot of kudos in these parts by abolishing the tolls - but I was soon the find out that the bridge has its drawbacks. "We were promised so much," said Harry Slater who runs a cafe by the old slipway at Kyleakin on the Skye side of the water. "When they took the ferry away and gave us the bridge, they promised the facilities at Kyleakin would remain. "But we've since lost the toilets, the bike hire shop, the youth hostel, we're about to lose the Post Office and the only shop. We've been forgotten." Mr Slater said the Cal Mac ferry should have been allowed to stay, not given a £1m subsidy to close down. Then people would have had the option of crossing "over the sea to Skye" and the tourist trade at Kyle and Kyleakin could have been saved. In Kyleakin, I was told the same story by Sally White in her Old Bank House bed and breakfast. "We're flying the flag for the Homecoming," she said. The blue flag was indeed flying from her flagpole, but she added: "People tend to pass through Kyle without stopping because of the bridge." And She told me another disturbing story: "Since devolution and all these arguments between Scotland and England. "There's been an increase in prejudice against incomers like us from England. "My little boy was bullied so badly at his primary school I had to move him." My faith in devolution was restored when I fell into conversation with the Canadian proprietor of the Haven Hotel in Plockton, a few miles up the coast. He delivered a fine lecture on the merits of government being as close to the people as possible. The Canadian provinces should be an inspiration to Scotland, he declared. The Strome Ferry is a great loss to cyclists because it means we have to slog all the way round Loch Carron. The road has hills so steep, I not only had to push the bike up, but walk it down again for fear of wearing out my brake blocks. I felt as foolish as the Grand Old Duke of York. The village of Loch Carron, though, was worth reaching. It's active community life was reflected in the notice board . . . ads for the gold club, the sailing club, the shinty club, a church youth group, a gardeners club. The village boasts one of the top 10 local shops in Scotland. My first rainy day of the trip took me to a lovely little coffee shop in Shieldaig on Loch Torridon. The conversation turned on whether the owner's young children would be better off going to the local school, currently with 3 pupils but soon to go up to 10, or whether they would be better off in a merged school with Torridon (6 pupils) and Kinlochewe (13 pupils). It's an issue which has puzzled the parliament too, with a bill currently before MSPs suggesting a "presumption" against the closure of rural schools. I was soon to meet the 13 pupils of Kinlochewe. Their last lesson that wet Friday afternoon was on the environment and they were out with their plastic bags collecting litter around the village, most of it thrown from passing cars. "It's a disgrace," said one of the young eco warriors. "How can people do that to our lovely countryside?" Their teacher told me the children naturally take to environmental lessons and they are very keen to win a green flag which would officially designate their school an "eco school". 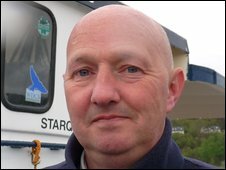 In Gairloch, the first man I met was a marine biologist, Ian French. "My wife and I have been running sealife boat trips for 20 years," he explained. "I don't think the Scottish Parliament realises just what an asset Scotland has in its seas. The wild life here is as good as the Great Barrier Reef or the Galapagos Islands." Mr French listed the creatures he takes parties out to see . . . great northern divers, sea eagles, half a dozen types of whale, seals, harbour porpoises. I asked whether the seas were better protected by Edinburgh or Westminster. He responded: "Edinburgh. The nearer, the better." The cycle around the coast to Loch Broom and Ullapool is spectacular. The larch trees were just coming into light green leaf. But there were beeches too and huge Wellingtonia trees pointing to the milder, wetter climate of the west coast. Alas, I passed my sixth dead badger. I arrived in Ullapool on Saturday evening to see the last ferry leave for the Western Isles. No sailings now till Monday. "They don't like our mainland ways, breaking the Sabbath and all that, on the Islands," the garage man explained. The next biggest boat in the Loch was a Norwegian fish factory ship collecting supplies from a queue of local boats. Watching from a pub along the shore were a group of bikers from Fraserburgh. "We're up for a camping weekend and a good time," they laughed. They must be the ones who roared past me on the road, flashes of black, red and yellow. I dare not ask what they thought of the Scottish Parliament in case they thought I was power-crazed. And so, the last leg of the devolution cycle begins up to the north coast, to see what those brave souls who live on the edge think of "home rule". From Ullapool I entered John Muir country, wild big rocky mountains, Suilven, Canisp, Ben More. 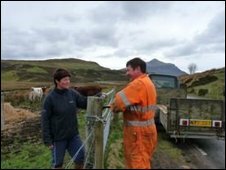 I was on the edge of the kingdom of the Assynt Crofters, beneficiaries of the Scottish Parliament's land reform agenda. They were allowed to buy their land, under the "community right to buy". None of them were in when I passed through. No doubt they were out tending their land holdings. But I found one traditional crofter feeding her cattle in a "field" by the road. "I can't honestly say the new parliament has made any difference to me," said Tessa Dorrian. " But it's only been in existence 10 years, so it's really too early to tell." She has 30 cattle and spends three or four hours a day looking after them. She has a day job too, on a fish farm, and has a family household to run. The people around here are as hard as the rocks. I spent the night in the tiny village of Kylesku, close to that remarkable curved concrete bridge over Loch Glendhu. The road then swings out to the coast and the holiday hamlet of Scourie with a telephone exchange that looks big enough for NATO headquarters. Indeed NATO is not far away from these parts. In Loch Ewe I cycled past a refuelling station used for NATO exercises around Cape Wrath. The European Union is not far away either. The roads are fit for a oil sheik and part-funded by the EU. At Kinlochbervie I expected to see a quaint white washed fishing village. Instead, there is a fish market that would accommodate several blue whales, again courtesy of the EU. 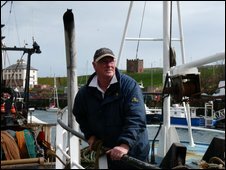 Unfortunately, as one of the trawler skippers, Derek West from Banff, explained: "This place used to be so busy. On a Monday and a Thursday you could hardly get into the harbour but since they built the new fish market, the EU has reduced the fishing industry to a shadow of itself." He says the bureaucrats in Brussels don't understand that there are plenty of fish in the sea. "The Scottish government is trying to change things but they have their hands tied." I reached the north coast across a bleak turf-cutting moor and came to the holiday town of Durness. This is about as far from the Scottish Parliament as it is possible to be. At the primary school though, the head teacher Graham Bruce tells me he doesn't feel at all isolated. "No I don't feel on the edge of things," he said. " I think the parliament has been good for education. It's allowed us to find Scottish solutions to Scottish problems and not have systems imposed from England." The 25 pupils in the school told me they don't feel isolated from the rest of Scotland either. And they sang me the "The Bonnie, Bonnie Banks of Loch Lomond" to prove it. At the arts and crafts village of Balnakeil, out towards Cape Wrath, artist Ishbel Macdonald said the parliament had not made any difference that she could feel. The artistic life of the nation was already strong and healthy, she said. Boatbuilder Martin Mackay though felt the reason might be because it lacks full powers. " I think it's a good to have a parliament of our own and maybe what's needed is a bit more power for Holyrood and less rule from London." This craft village, in an old army camp, has attracted a dozen different artists and businesses. Like Kevin Crowe's booksellers, which had the politically fortunate foresight to publish the culture minister's Mike Russell's latest novel, "The Next Big Thing". To save you reading it, it's about someone who finds John Lennon drawings under the wall paper in an old house and how the media descend on the story like sea gulls. On my way out of Durness I chanced on the very house where, it says on a plaque on the wall, John Lennon "spent many childhood holidays" Imagine. And so to Thurso, my last town on this devo voyage. I arrived in the rush hour. A stream of cars and buses brushed past me on the road, in from the Dounreay nuclear establishment, all occupied by men and women in yellow safety jackets. A strange sight in such wild setting.
" 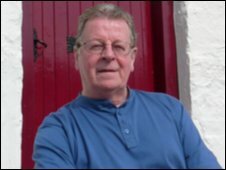 Without Dounreay, Thurso would be a ghost town," butcher Ernie Bain told me. " We need a replacement for it. The Scottish Parliament should be doing something about that, not wasting time and money just talking." Thurso does have other industries. But not many. There's tourism, of the windy sort and surfing. Over a hundred surfers from all over the world are here for the next week taking part in the O'Neill Coldwater Classic, one of the qualifying competitions for the world championships. They are welcome to their cold water. I'm off to the warm seas of John O'Groats. I arrived at John O'Groats at noon on a bright windy day with the tide throwing up a line of white waves in the Pentland Firth. The first person I met was the local countryside ranger Mary Legg, who was busy repainting one of the benches. "It's a great coastline but it can be a bit windy," she said in the light understatement outdoor folk are used to. She wiped her hands and agreed to take my triumphant photograph. I then met a girl who'd cycled here in six days from Lands End, which rather turned my triumph into a whiter shade of pale. I've been on the trail for nearly a month, more than 1,000 zig-zagged miles from Gretna. And what have I learned? That Scotland is alive and well outside Edinburgh. I thought the recession had brought the country to a halt. I thought people might be proud of their parliament. In both cases I was proved wrong. Unemployment may have risen to 5.4% during my journey, but the other 94.6% are working away. I spoke to farmers, guest house keepers, garage men, boat repairers, who all reported good business. New houses seem to be being built in every little town and village I passed through, nice houses too, with a bit of Scottish style, unlike a few years ago. Roads, village halls, schools, medical centres all seemed new or newly refurbished. Whether this would have happened without devolution we can't be sure, but most people I talked to seemed to think it would. Out of every four people I chanced upon, one would be enthusiastic about the new parliament, two would be sceptical, and one would say it was a waste of time and money. Just about everyone is still appalled at the expense of the Holyrood building and have not forgiven the politicians for it. Tales of expenses extravagance in London have added to the disillusionment. The political class just don't seem to get it, they are already living on twice the average salary and yet want more. And another message that came through to me on this unscientific journey through devolution was that people are prepared to be grown up about political choices ... over school closures, fishing limits, health services, energy costs ... they want a real debate and real leadership from politicians with specific proposals, not waffle and inaction. Most people said the Scottish Parliament had not made any difference to their lives or their jobs or the state of the country over the past 10 years. They are happy with the principle of devolution, many even want the Scottish Parliament to have more powers, but they feel it has yet to prove itself. Finally, what I have learned from this journey is what a wonderful country this Scotland is .... its landscape is breath-takingly beautiful, it's people remarkable for their realism and enterprise. I'm thinking of those fishermen, farmers, school teachers, coffee shop owners, B and B people, walkers, fellow holiday-makers ... all the folk that I met along the way. 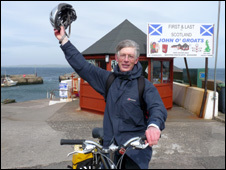 And what does John O'Groats himself think of it all? Well, I'd just like to thank the Scottish Parliament for inspiring this journey. And I'd like to thank my bicycle. What has devolution done for us?